As technology continues to grow and evolve at ever increasing rates, the way in which it’s impacting businesses will do the same. 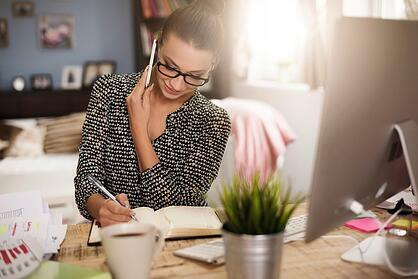 One of the most prevalent changes already taking place is the increase in telecommuting. According to a recent Gallup poll, not only are more workers telecommuting at least part of the time (37% in 2015 vs. 9% in 1995), but the views on telecommuting are changing as well. In the past, telecommuting was looked at with some suspicion. However, these negative perceptions are beginning to fall away as telecommuting becomes more and more popular and its benefits are proven in study after study. As important as it is to ensure that the employee can be an effective telecommuter, it’s just as critical that the individuals responsible for managing telecommuters are comfortable with managing remote employees and are able to do so. Supervisors that tend to get more involved with their subordinate’s work, or prefer to have a tight pulse on what their team is doing at all times, may not be an effective manager of remote employees. Making sure that the leadership style of the manager meshes well with the unique aspects of supervising remote employees is crucial. This tip isn’t just limited to hiring remote employees, ideally all communication with applicants regardless of the position they’re applying for should be as transparent as appropriate. However, with remote employees, making it known up front (either on the job description or job posting) that the position involves partial or full-time remote working is essential. This will help filter out the candidates who aren’t interested in telecommuting. Additionally, if your company has particular guidelines or expectations as to procedures or processes that remote workers must abide by, make sure to review them early in the process in a clear, unambiguous manner. This can be a tricky one, because while it’s important to ask questions to gauge whether they’re an appropriate candidate for a remote position, some questions are legally dicey at best. For example, it’s important to find out whether an applicant for a remote role is going to be productive, engaged, and undistracted during their work hours. However, probing into this topic needs to be done carefully, asking not about specific aspects that may affect the performance of their duties (“do you have kids who will distract you?”), but instead asking generally about any potential distractions, and allowing them to answer. Additionally, finding out more about their physical environment can be telling. For example, you’ll want to know whether they have a dedicated home office or just work from the couch, if they have adequate internet and phone connections, etc. Just like any other type of role, there are skills and competencies that lend themselves to being successful in a telecommuting position. You wouldn’t want to hire someone with poor communication or networking skills as a remote employee in the same way that you wouldn’t want to hire someone who can’t swim to be an underwater welder. It helps for a remote employee to have above-average capabilities in competencies such as communication, initiative, and organization when working separately from their co-workers and teammates. In addition, as they may be responsible for being their own tech support if a problem were to arise, looking for skill in troubleshooting related to phones, internet, and computers may be helpful as well. Someone who is afraid of technology likely would not excel in a role that depends so heavily on it. Again, ensuring a high level of motivational fit (learn about the interview questions you should ask to assess motivational fit) between the applicant and position is not unique to telecommuters. Looking for an applicant whose personal preferences and style as it relates to their telecommuting practices line up with those of the organization will maximize their likelihood of succeeding. If your organization expects their remote employees to be online during set hours, follow certain procedures or processes, and in general abide by specific telecommuting guidelines, finding someone who not only works remotely, but is comfortable with those demands, is key. A telecommuter that prefers to wake up at 1:00 p.m. and work until midnight would not fit well in a role requiring them to work a traditional 9-5 schedule, for example. The telecommuting trend is showing no signs of slowing down, so knowing how best to select for employees that will be working in a remote capacity is going to become more and more crucial as time goes on. Following the above tips will help put you on the right track towards building a team of top-tier telecommuters.